Has your child ever needed a diaper change and you realize that you have run out of wipes? Or you took your kid out grocery shopping and then suddenly remembered that you left your wallet back at home? What about having to deal with a screaming, tired and hungry toddler? If you have ever experienced any of the above, firstly, we empathize and commiserate. Secondly, you will no doubt have realized that when you become a parent, organization suddenly becomes not only a useful thing to have but is also essential to your child’s comfort and well being (and your survival as a sane parent). In the first couple of years, when your kids are young and tire easily, moms often spend a lot of their time carting their kids around in strollers to the playground, libraries, playdates etc. It’s not uncommon to hear of moms taking their kids out in the stroller at least once every day. What Common Baby/Child Items Do You Need To Bring When Going Out? 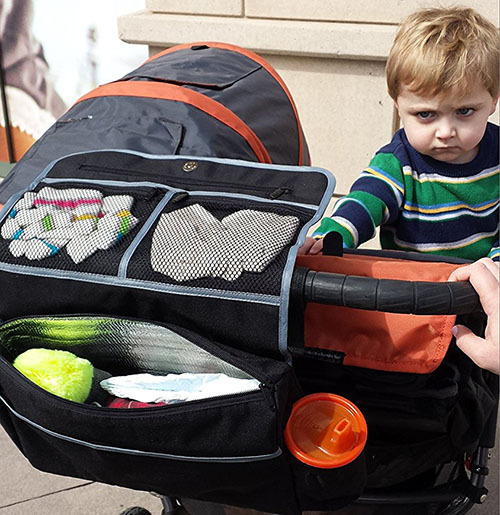 One of an organized parent’s best kept secret is a great stroller organizer. Unlike the basket underneath your stroller, a stroller organizer allows you to keep all your must-haves within easy reach. Most stroller organizers are designed to be hung on a stroller’s handle bars so that you don’t have to carry a diaper bag with you. Nor do you have to frustratingly bend down to dig around in your large stroller basket for the one item that you want, which is often buried underneath something else. Depending on what kind of mom you are, you will probably have preferences for different kinds of stroller organizers. Some moms feel more secure if they bring everything with them. Others prefer to travel light. Of course, your choice of a stroller organizer will also depend on how long you plan to be out (the longer, the more stuff you will need to bring with you), the number of children you have, their age etc. We make our recommendations based on the typical kinds of moms that we meet. These caricatures will not represent every type of mom out there, nor be 100% accurate but read this knowing that this is tongue-in-cheek. We also hope that our recommendations below will help you find a stroller organizer that you like. You know the Fit Mom. She’s always in tight leggings or yoga pants and the way her clothes cling to her shows off all her toned muscles. When it is sunny, she will have sunglasses and maybe a baseball cap on. You often see her jogging pass you while she pushes her little one(s) in their stroller, reminding you of your lack of exercise in your life. She’s normally extremely energetic and motherhood doesn’t depress her. Nothing depresses her. Space to hold at least two bottles of water (one for you and one for your little one). Sturdy material to securely hold the bottles of water while you jog along. Extra storage pockets to hold keys, sunglasses, sunscreen etc. We think Fit Moms will love the Novopal stroller organizer because it not only is designed to hold two separate bottles of water, it also has an additional separate anti-slip safety buckle to keep your stroller organizer secure while you are bounding over those rocky pathways. 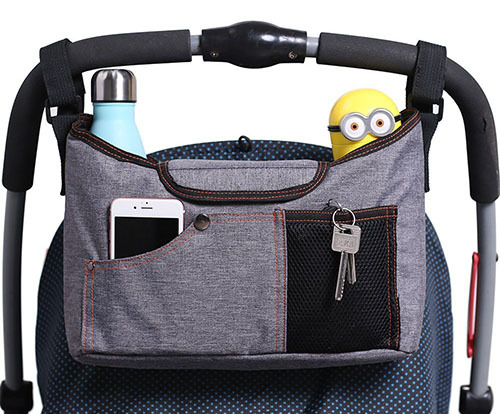 In addition, this stroller organizer comes with a magnetic closure on the top and a shoulder strap that allows you to carry the stroller organizer like a handbag if you need to whip into the car with it. It also has several pocket compartments to hold smaller items such as keys, cell phone, wipes and tissues. The Starbucks Mom is made of coffee. She needs Starbucks to perk up and without coffee, she feels like a zombie. We don’t blame her because we know how exhausting motherhood is. Because of this, she always makes time to make a stop at her favorite Starbucks branch. Her favorite day is a catch up with other mom friends, over coffee of course. Secure cup holder to hold your coffee securely with minimal spilling risk. Made of sturdy material to prevent accidents as you navigate your stroller over bumpy sidewalks. Compartments to hold other important stuff such as your car keys and wallet. 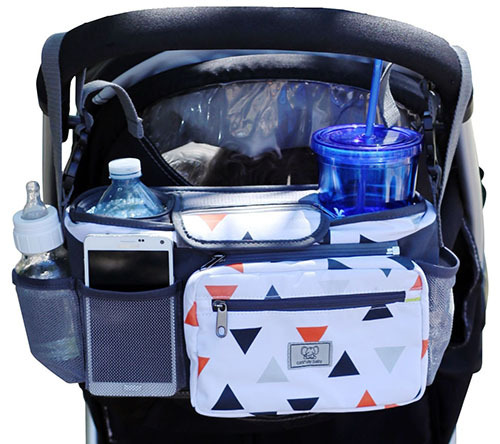 There are many stroller organizers on the market but although many of them are designed to hold two beverages, some of them don’t hold drinks very securely. We recommend the Ethan & Emma stroller organizer for Starbuck Moms because the stroller organizer is well-designed, reinforced and made of a relatively more sturdy material for holding up drinks. 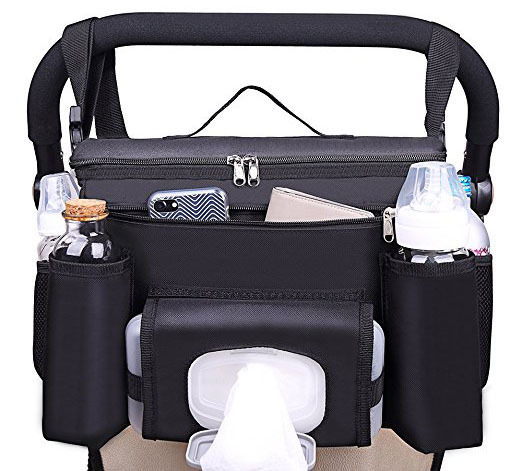 Unlike some other stroller organizers that merely use mesh pockets to hold beverages, this stroller organizer is designed so that your drinks are securely held within the main compartment of the stroller organizer itself. This reduces the risk of spillage. The cup holders can fit a range of different sized Starbuck cups and are insulated to make it easier for you to keep your Starbucks beverage at your preferred temperature. Trendy Mom is the mom that you want to look like. Her hair always looks perfect and she is always wearing a designer label. In fact, you found out that the reason her after-delivery photos look so great is because she found time to put on makeup. She makes motherhood look effortless, even though all mothers know that this is a lie. You don’t want to die of embarrassment over how you look as a mom. It’s important that the stroller organizer you are carrying will not let you down if you are spotted by a fashion photographer. Handy little compartments to carry stuff such as your lipstick. The Anvy & Me stroller organizer is made of eco-friendly material and comes in 3 different cute colors and designs to suit your mom-style. It doubles up as a mini diaper bag and there is an additional pouch that can also unzip to become a separate small clutch. The outside material is waterproof. There are an inner mesh pocket and 2 mesh side pockets on the left and right. The main compartment holds up to 3 beverages. There are adjustable 2 straps that will fit most strollers on the market. It’s also nice that this stroller organizer comes with a lifetime guarantee. The HaloVa stroller organizer has several stylish, sleek, clean designs that would look decent in a fashion magazine. Made of good quality Oxford fabric, this stroller organizer comes with 1 main compartment, 1 hidden separate layer, 2 cup holders and 1 front outer pocket. Instead of using Velcro, the handles of the stroller organizer uses clips. This mom is practical. She doesn’t care how she looks, she doesn’t care if she appears in a fashion magazine, she only cares that things are convenient and easy to access. Don’t waste her time with frivolous things, she is focused on making sure that she only carries around the things that she really needs. Stroller organizer with as many pockets as possible so that you can organize things well. 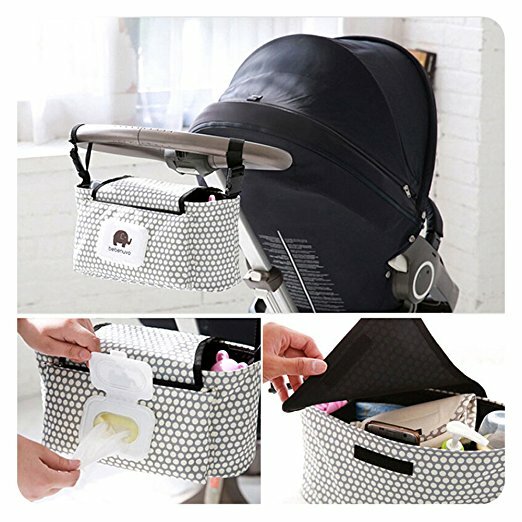 Stroller organizer that can double up as a handbag as well. The Cashay Baby stroller organizer is water resistant. It comes with a decent amount of storage pockets, a separate zippered pouch, main compartment with an inner zippered mesh pocket on top, 3 mesh pockets on the exterior and a larger foldable mesh pocket and insulated cup holders. More importantly, this stroller organizer comes with a removable clutch which you can use to carry the bare minimum. It also comes with a lifetime guarantee. The AMZNEVO stroller organizer has several easily accessible compartments to make it super convenient for a Practical Mom to get at stuff. It has 2 cup holders, 3 exterior pockets and 1 large main compartment. Best of all, it also comes with a shoulder strap so that a mom-on-the-go can quickly turn this into a handbag as well. Super Prepared Mom is the kind of mom who tends to have an extra of everything- extra wipes, extra diapers, extra changing pad, extra blanket, extra sippy cup, extra snacks for her child (as well as for other kids), extra pair of clothes, extra warm jacket etc. She’s the kind of mom you would want to approach if you run out of diapers or wipes because she always has extra. She tends to carry huge bags because she has so much that she wants to bring along with her. You do not want to her luggage carrier if you were travelling together. The bigger the stroller organizer, the better. Enough storage pockets to store as many things as possible. The Rumbi Baby 5-in-1 stroller organizer is for Super Prepared Moms. 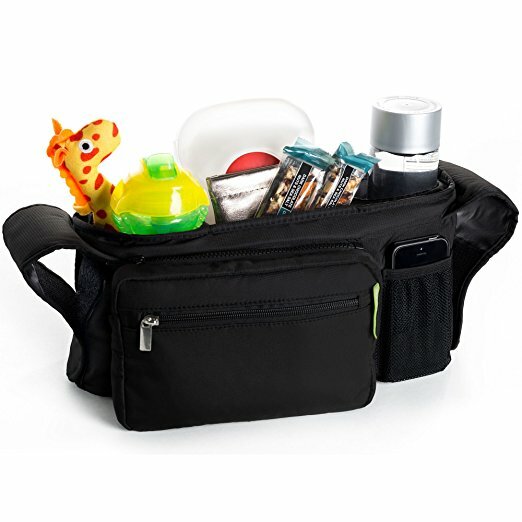 This stroller organizer converts into a shoulder bag, back seat car organizer as well as protector. It’s big enough to use as a diaper bag too. 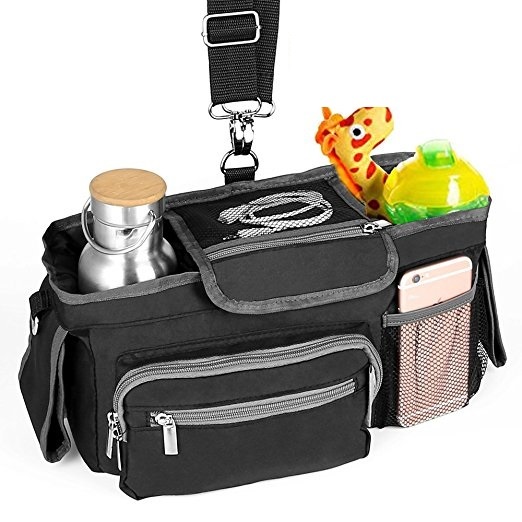 This bag is perfect for a mom who hates having to constantly pack and repack items and would rather have everything in one handy convertible organizer that could be used in the car as well as outside like a diaper bag. 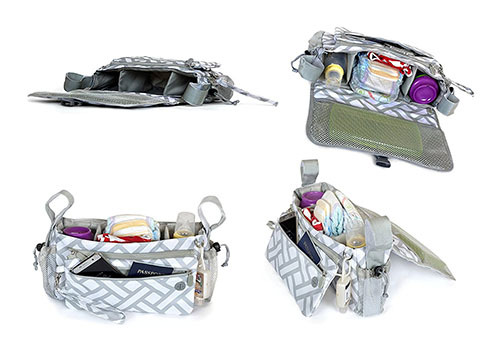 The entire main compartment of the bag is insulated so it’s perfect for moms who find that they have a lot of cold or hot items to bring along with them. There is a pocket on the left and right side and two separate mesh pockets within the bag itself to provide additional pockets for smaller items. One downside to this bag is that although it is large, the main compartment is one single section. This means that if you want to bring a little bit of everything and keep everything separate, you may want to consider getting plastic bags to separate everything out. 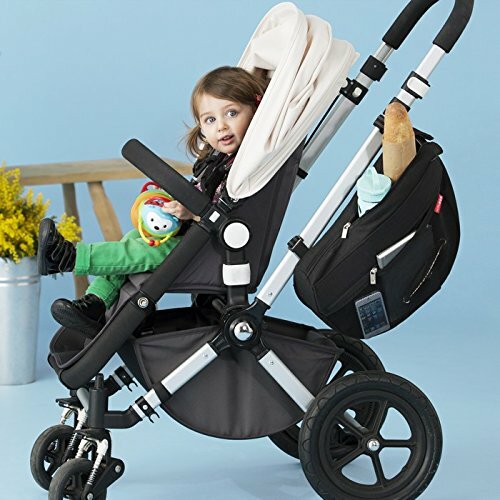 The Skip-Hop-Grab-and-Go stroller organizer is different from other stroller organizers in that it hangs on the side of a stroller handle and not the top. This makes it perfect for umbrella strollers or to be used in addition to other stroller organizers. It has an insulated interior and an exterior mesh zip pocket and basically can provide extra storage space without unbalancing the stroller. Great for Super Prepared Moms who have a lot to bring along with them. Important Mom feels that her work is one of the most (if not THE most) important thing in her life. It’s a close tie between work and family. She is busy working most of the time but she does find time to hang out with her kid(s). She may carry around a tablet or laptop to work from. She loves the latest electronic gadgets. Time management is extremely important for her and she not only shows up on time to events, she is often early. Good quality stroller organizer- money is no issue. Space to bring work or an iPad along. 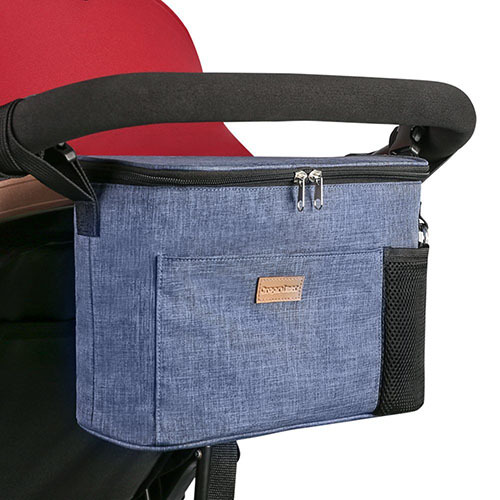 The VIAEON stroller organizer has some nifty designs such as an external tissue box, four deep cup holders, buckle strap design (more secure than Velcro), a long shoulder strap and plenty of storage space. It is also pretty big in size (15 x 10 x 5 inches) so that you can truly carry everything that you need in this. The Joyren stroller organizer has a clean, simple and modern design with a large exterior back pocket that is perfect for holding iPad minis and other smaller notepads. It comes with a shoulder strap and is made of waterproof fabric for easy cleaning. It designed to protect privacy with a flip top design so that you can store away important, private stuff. We hope that you enjoyed reading the mom portrayals above and had a quick laugh. Remember that you may fit none of the descriptions above or have a little of everything above in you. At the end of the day, who cares about the descriptions, just choose a stroller organizer that suits you!